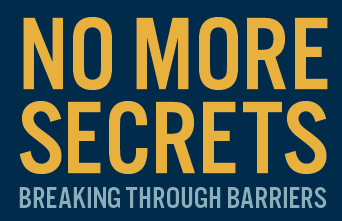 No More Secrets aims to combat mental-health stigma in local communities and connect individuals and families with the resources they need. This symposium is FREE and lunch is provided. To register, visit namicoloradosprings.org or call 719-473-8477. 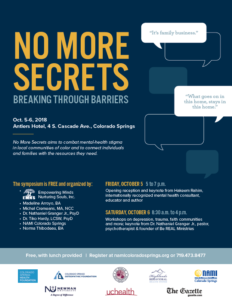 Now in its second year, the No More Secrets symposium aims to amplify mental health awareness within underserved local communities. 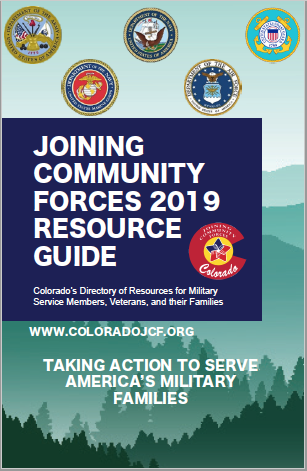 It is completely FREE and organized in tandem with leading local providers of color, including Yolanda Lewis-Harris, LPC, CACIII, Dr. Nathaniel Granger Jr., and Dr. Tiko Hardy. Appetizers will be served Friday evening, with a cash bar available. The reception and all sessions are FREE. However, registration is required. The theme of this year’s event is “Breaking Through Barriers,” reflecting an overarching goal of helping people move closer to seeking mental health services and resources.